The Whitebriar Bed & Breakfast in Edgewater Park, New Jersey boasts of antique furnishings, collectibles and oriental rugs and also it seems anti-LGBT hate. 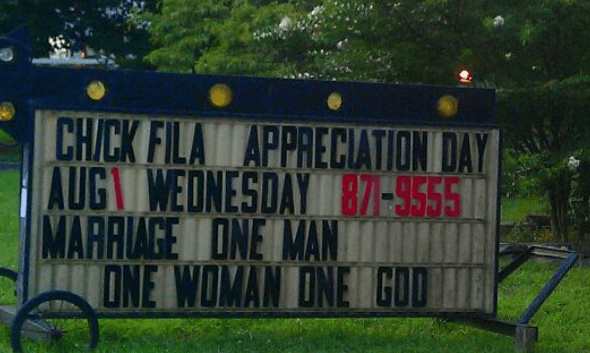 Recently lesbian mom Joanne Fraschilla and her son were passing by the Whitebriar Bed & Breakfast when they spotted the above sign in front of the establishment supporting Mike Huckabee’s Chick-fil-A Appreciation Day and touting one man, and one woman marriage. Joanne took to their Facebook page to express disappointment that her family was clearly unwelcome there. Joanne is planning a protest and wants the owners to apologize. Feel free to contact the Whitebriar Bed, Breakfast and Bigotry by CLICKING HERE. You know you want to.